I can't believe it's Monday morning again! Where do the weekends go? Now i have to confess i'm pretty much the worst morning person you could meet and it takes a lovely large cup of tea To get me up out of bed on a Monday. I'm sure i can't be the only one who requires such persuasion and i'm even more certain i'm not the only one who spends most of the early part of a Monday daydreaming about how wonderful the weekend was! So, today i bring you a new feature to Paper Crush. 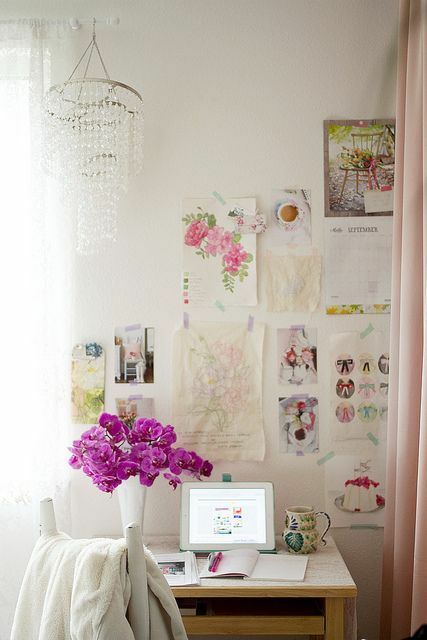 Something a little different i'd like to try - Office Mondays - each week i will share an inspirational office space to firstly brighten up our mornings, but also hopefully give us all some ideas of how we can beat the Monday blues with updates to our office spaces! I've been really inspired recently by the new book from decor8's Holly Becker - Decorate with Flowers. It really got me thinking about how effective adding a simple pop of colour to a room can make such a difference. Take today's Office Monday for example, as soon as i saw this it made me want to sit at that desk for my entire working week!